Made by Wynne, A, c. 1920. This is a hooded Whitechapel buggy made in Australia between 1914 and 1924 by Arthur Wynne, a coachbuilder from Horsham, Victoria. 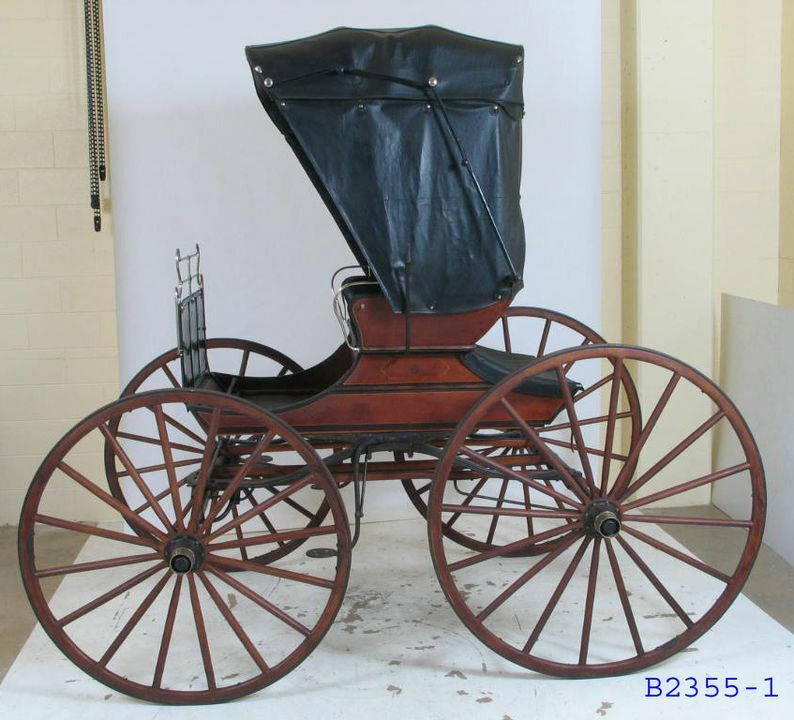 Horse-drawn buggies were very popular in both America and Australia from the mid-nineteenth to the early twentieth centuries. This small, four-wheel, horse-drawn buggy carried a driver and passenger on a single seat. It is constructed of strong and resilient timbers such as hickory. The hooded body is mounted on semi-elliptical leaf springs attached to the sides of the undercarriage. All this is supported on thin, 'spider' spoked wheels with Sarven patent cast iron hubs. The addition of steps on both sides indicates that the vehicle was used by a woman driver. There is a lockable boot at the rear. There is provision for one or two horses via a pole and a pair of shafts. All fittings are nickel silver, upholstered in leather with new patent leather fittings. This buggy was built by an Australian coachbuilder, Arthur Wynne, in Wilson Street, Horsham, Victoria. Arthur Wynne was born at Tatyoon, Victoria, in 1871. He served his apprenticship after leaving school, with a coachbuilder in Donald, Victoria, in 1901 and went into partnership with a Mr Scott of Murtoa, Victoria, under the name of Wynne & Scott. Arthur Wynne moved his family to Horsham in 1914 and established his own coach building business, A. Wynne, in a former jam factory at 100 Wilson Street. Arthur Wynne himself was the body builder and wheelwright and he employed a blacksmith, a painter and an upholsterer to finish his vehicles. At first, coach building, repair and maintenance of horse-drawn vehicles were the firm's chief work, but gradually coach building was replaced by motor car body repair and painting. The coach building side of the business ceased in the early 1930s. The firm became A. Wynne & Son after one of Arthur's sons, Arthur Robert Wynne, joined the business as an upholsterer in 1925. He was followed in 1931 by another son, Leslie Alfred Wynne, who was a painter. The old jam factory building was replaced in 1934 with a new brick one and Arthur Wynne retired. He died in 1944 and the business was carried on by his sons until 1954, when it was purchased by Ranley Panels Ltd.
Information provided by R.A. Wynne of Horsham, grandson of Arthur Wynne, in 1981. Nothing is known about the history and use of this Whitechapel buggy.